Project SEARCH at Bryn Mawr Rehab Hospital, an educational and work transition program for those with cognitive and/or physical disabilities, is customized to the needs of each participant to help them gain and sustain employment and greater independence. Project SEARCH works with the business community to match their business needs with the intern's talent and abilities. Established in October 2010, Project SEARCH at Bryn Mawr Rehab Hospital combines real-life work experience through the integration of classroom instruction and on-the-job training. The cornerstone of the program is immersion in the community and partnering with local businesses and corporations to provide our interns with on-the-job experience, job coaching and mentoring that provides the skills and experience that allows them to compete for jobs on an equal footing with other candidates. In partnership with the Pennsylvania Department of Labor & Industry’s Office of Vocational Rehabilitation and local business partners, Project SEARCH is a unique program that offers adults with disabilities the tools and training they need to work a minimum of 20 hours per week in a job that matches their interests and capabilities. The program is broken down into three sections: classroom training, internships and job development. Work readiness includes, but is not limited to: education on worker characteristics, professionalism, dress, communications, rules, etc. Business communication: developing a resume, writing a cover letter, completing an application, etc. Ongoing monitoring and support from peer mentors and job coaches, as needed. encourages and supports interns to apply for positions during a 16-week period, if not immediately hired. offers opportunities to meet with Project SEARCH staff to complete job searches, fill out applications, prepare for interviews, etc. interns will have support of a job coach on their employment interview as well as support on site when employment is secured. supports interns as they independently pursue jobs, after the completion of their training. Main Line Health System was Project SEARCH’s first business partner. Bryn Mawr Rehab Hospital is always expanding the number of companies and local businesses involved in Project SEARCH, enriching the number of opportunities within interns’ reach and facilitating the hiring of excellent employees. Our job coaches aren’t the only ones helping the program intern achieve their goals. Peer mentors are employees of the Project SEARCH business partners who step up as a natural point of support for the intern as he or she transitions into their internship. They complete the participant’s initial training and become a natural point person for any questions, as well as meeting with the intern and Project SEARCH staff on a routine basis to ensure everything goes smoothly. The positive effect of more people achieving gainful employment is obvious, but the community benefits of Project SEARCH are not only for the interns. 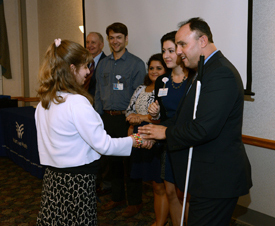 A combination of funding from the Office of Vocational Rehabilitation (OVR), Bryn Mawr Rehab Hospital and many generous donors covers the costs of training the businesses that hire Project SEARCH graduates. The businesses gain proficient employees who work hard, like learning and take pride in their jobs. Businesses who hire Project SEARCH graduates also enjoy excellent employee retention in jobs that typically suffer from high turnover, offering job-training savings that boost the company’s bottom line. For more information about Project SEARCH, contact our program coordinator at 484.596.5406.